Introduction-MySQL to MSSQL Database Converter Utility is the best way to convert selected or whole records of MySQL database in to MSSQL database sever. Database Converter software converts database with all necessary datatype attributes including indexes, primary key and default value constraints. Converter utility facilitates users to convert views as well as table definitions along with option to skip converting indexes. 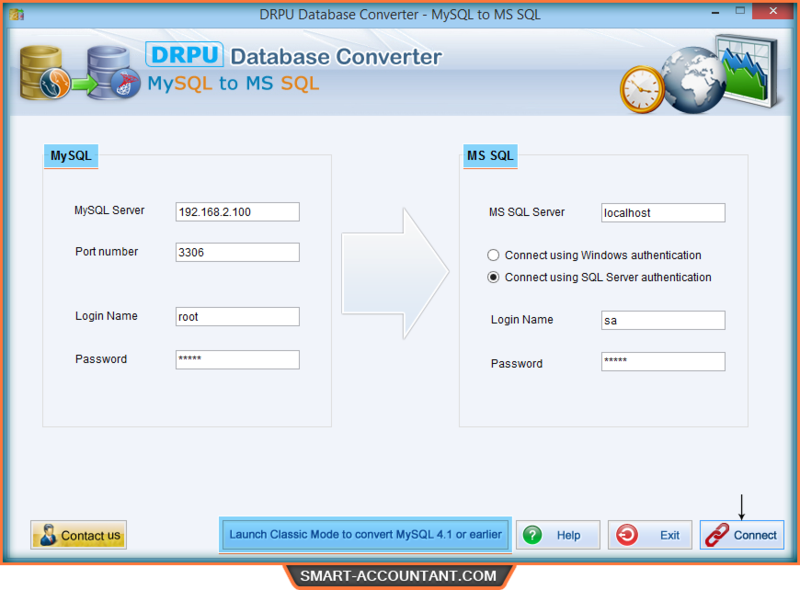 DB converter tool for MySQL to MSSQL Database helps to convert data base in both cases when user wants export MySQL records into MSSQL database or overwrites converted database into existing database. Database file conversion software supports to all major version of database server and maintains database integrity. Classic mode option is also available to convert earlier version of MySQL Database. √ DB converter utility can convert views as well as table definitions. √ Database converter utility provides option to skip converting indexes. √ You can connect your MySQL server to MS SQL server either on remote location or on local host. √ Convert large volume MySQL database records into MSSQL database server. √ Overwrite converted database into existing database or save converted database at new location. √ Support to indexes, primary keys, default values and all necessary data type attributes.